Teams of 8-15 people take turns around a track, with a minimum of one person per team on the track at all times. You can walk, run, crawl, hop, skip or jump your way around. It is not a race, it's not about distance, and it’s about supporting those for whom cancer does not sleep. 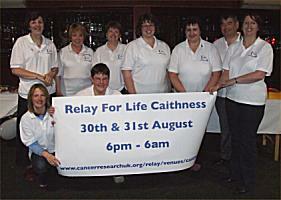 To promote the Caithness Relay for Life, launch nights were held. These nights were themed on Health, Beauty and Relaxation, with a number of local therapists and beauticians who are going to be there offering advice for both men and women.